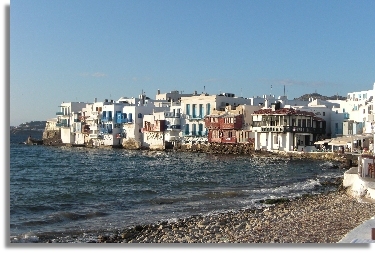 Mykonos is part of the Cyclades, lying between Tinos, Syros, Paros and Naxos. The largest town is Hora, on the west coast of the island. Mykonos is one of the most cosmopolitan islands in Greece, having become increasingly popular with tourists. It is known for its diverse and intense nightlife as evidenced by a vast number of bars and nightclubs. Mykonos is also known for its sandy beaches. It is also one of the best places in the Aegean to get away from it all, to relax by a pool or on a beach, or to explore ancient history and archaeology, to follow the stories of ancient legends, to sit in a taverna or καφενείο with a Greek coffee or an ouzo and watch the local colour while soaking up the culture. Apart from the obvious attractions of beaches and nightlife, there are many activities for visitors of all ages, including Scuba diving, horse riding, go-carting, paintball, sailing, windsurfing, tennis courts, museums, archaeological ruins, daytrips to other islands (particularly Delos). Overnight visits to Athens are also easy. Shops tend to open early (7:30 – 08:00 ish) and close by 13:00 until late afternoon, but then are open through the evening. The nightlife of Mykonos is marketed as among the best in Europe. Mykonos also attracts famous DJs to its renowned clubs and beach bars. Mykonos nightlife focuses mainly on bars rather than clubs, yet a number of notable clubs can be found throughout the island. Mykonos still has quite a number of fishing boats that drop their catch on the seafront in Hora, from where tavernas pick up their supplies for the day. Menus therefore have a lot of fresh seafood. It is well worth while exploring Greek cuisine via traditional dishes. Local wines - from all over the Aegean as well as Mykonos itself - are inexpensive and very good. With the exception of Samos wine, which is usually a sweet dessert wine, most Aegean wines are dry and white. Petros the Pelican (left) - An old celebrity of the town's waterfront, "Petros" has been the official mascot of Mykonos for over 60 years. 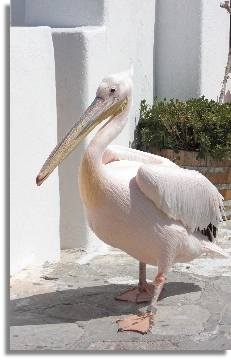 Petros was a Great White Pelican, who was the official mascot of the Greek island of Mykonos. In 1958 a wounded pelican was found off the coast of Mykonos by a local fisherman. The pelican was nursed to health and remained on the island supported by locals. It soon adopted the name “Petros”, as a joke between the locals, as "petro" in Greek means rock, stone but metaphorically hard and horny. To great disappointment by locals and tourists alike, Petros was hit by a car on 2 December 1985 and failed to recover. Subsequently, three new pelicans were found. One, donated by Hamburg Zoo, was given the name Petros (despite her real name actually being Georgia). A second, named Irene, was donated by Jackie Kennedy-Onassis. Another, who was also rescued after injury, is named Nikolas, but has since sadly died. Further, in July 2013, Georgia/Petros was also hit by a car and killed. The story was given that the driver was trying to avoid a group of children. Sadly, that's not true. He was drunk. The island now has only one pelican, but efforts are being made to find more. Should you miss Petros walking around Hora, you can usually find him in his enclosure by CineManto, which is one of our favourite spots on the island - it is set in beautiful cool, shaded gardens in the town centre. It includes not only one of the best open-air cinemas we know, with films in English and in Greek (with subtitles) - while watching the film, try fresh popcorn or souvlakia - but also a really great, inexpensive restaurant with wonderful grills. 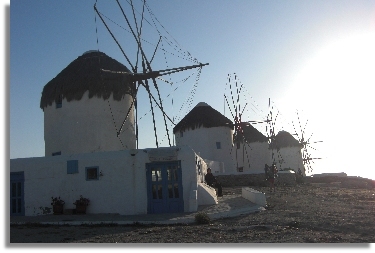 Mykonos windmills (above right) - From as early as the 16th century, they are one of the most recognized landmarks of Mykonos. Little Venice (top picture) - Here the buildings have been constructed right on the sea's edge with their balconies overhanging the water. 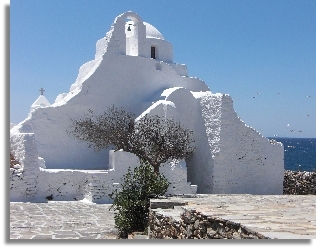 Church of Panaghia Paraportiani (below) - One of the most famous architectural structures in Greece. Its name means inner or secondary door which it was for the mediaeval stone walls which encircled the area. Four small churches (Agios Sozontas, Agioi Anargyroi, Agia Anastasia, Agios Efstratios) were joined together, and a fifth added on top to make the dome. Archaeological Museum - Houses marble sculptures, ceramics and jewellery recovered from the islands of Delos, Rhinia and Mykonos. Aegean Maritime Museum - Displays models of a collection of ships from the pre-Minoan period through to the 19th century and nautical and ancient artefacts related to the history of shipping on Mykonos. As for the best time to be in Mykonos, July and August are very hot, anything up to 33 °C or more, and extremely busy. It's a very popular destination (much to the chagrin of islands around it, like Tinos and Syros!). Everything is open, and the island is humming. That's not OUR favourite season. In Spring and Autumn the island is much quieter, fewer shops & tavernas are open (but still more than enough!). Autumn features OXI day (pronounced Ohi) on 28 October, which is a public holiday, when there is a parade through Hora (the main town) with all the schoolchildren dressed in traditional Greek costume. In spring, particularly coming up to Orthodox Easter the island is coming to life, repainting, repairing and sprucing up going on everywhere, with flowers running riot, particularly marigolds and poppies, the scenery is still green rather than the brown of summer, and, as in Autumn, temperatures are cooler at around 20-25 °C (although we'd still recommend use of good sunblock). 25 March is Independence Day in Greece and is another public holiday, another occasion on which the children dress traditionally. If you would like to know when Orthodox and Western Easter dates are, select which year below and click "Calculate". If going from the UK, from late spring to early autumn, easyJet and British Airways fly direct to Mykonos (JMK) from London Heathrow (LHR) (BA only), London Gatwick (LGW) and Luton (LTN) (easyJet). There are also many charter flights available from all over the UK during tourist season. When direct flights are not running or are not available, you will need to fly to Athens (ATH) with Olympic (now part of Aegean - since stopping direct flight between Athens and London in 2011, Olympic have now reinstated them), Aegean themselves, British Airways or easyJet and either fly from there with Olympic or take a ferry (either Blue Star Ferries or Hellenic Seaways) from Rafina (via Andros and Tinos) or from Piraeus (via Syros and Tinos).